Chapada dos Veadeiros National Park is in the central Brazilian state of Goiás. It's known for its dramatic canyons and quartz crystal rock formations. 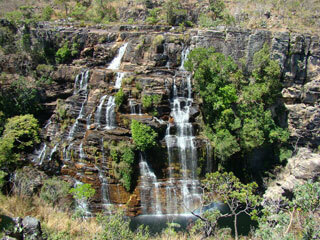 The Preto River has rock pools and waterfalls, some over 100 meters high. The biodiverse park is home to many orchid species and wildlife including armadillos, jaguars and toucans. Park access is from the nearby towns of Alto Paraíso de Goiás or São Jorge. This article uses material from UNESCO World Heritage List article "Chapada dos Veadeiros", which is released under the Creative Commons Attribution-Share-Alike 3.0 IGO License.